This entry was posted in Uncategorized and tagged FA Cup Semi-finals, Hillsborough disaster, Hillsborough Stadium, Leppings Lane, Life, Liverpool, Liverpool FC, Miscellaneous., Never Forget, Sport, The 69 by Multifarious meanderings. Bookmark the permalink. Thank you for taking the time to do so – much appreciated. Wow, what a beautifully written account of such a gut wrenching tragedy. I know I heard about it once on TV, but you really brought it right to me as if I was there. Thank you for writing this. This is a great memorial post. I am sure many will stop to think of the lost fans today after reading such touching words. Thank you, and thanks for reblogging the post. The aim is to make sure that nobody forgets what happened. I was hoping that words can be stronger than the pictures that will no doubt have resurfaced in the media today. To those who were lost, may they not be forgotten. May those who tried to help and the surviving loved ones be blessed with an ease of their sorrow. A terrible terrible tragedy for each and every family who lost a loved one. I can’t imagine how desperate you must have felt being penned in and unable to help. Thanks to this very moving post, I am. Thank you, Sarah. The feeling of inadequacy is still strong after so many years, but the need for it never to happen again is stronger still. Joanna – hugely courageous thing to write for publication. I hope that it helps in exorcising a horrendous demon. It is shameful that it has taken so long for the powers that be to acknowledge their responsibility for the cover-up, and I applaud those who have persisted in uncovering the truth. Shameful? Yes – just as shameful as those who applaud the work of foodbanks in the UK in feeding the poor. Those who do this work are to be applauded, but the fact that it is a vital necessity in our 21st century UK should be a cause of deep shame for us all. Our political masters still do not appear to inhabit the world in which most of us are obliged to live. I don’t think I will ever stop thinking about that day – it became part of me and always reminds me that every day is precious. I agree with you – it is too easy to come clean so long afterwards and be applauded. Those who fought to ucover the truth were the families of people whose reputations were dirtied by power-wielding figures who strived to cover up their failures by blaming the fans. Appalling and cowardly. a very moving post, MM, of reflection, of humanity, of survival, of unbearable pain. I know this is your recurrent nightmare as you’ve described it before. I hope that articles and posts like yours will keep the memories alive, and help us remember and pray nothing similar ever happens again. Hugs. B) a respect for the dead and injured and the feelings of their families. But football was only just becoming trendy when Hillsborough happened…it happened in the North…and those it happened to were regarded as the underclass…who didn’t matter. There was a strange attitude that led to Liverpool fans (24000 of them) being alloted a smaller amount of standing room than Nottingham Forest. People were treated like a combination of cattle and hooligans, when they were simply real people who had come to watch their team play. Double standards, unduly suspicious precaution and..I agree… prejudice, were at the root of the problem. Such a deeply moving and powerful account, MM, which deserves a much wider circulation. There is nothing to touch an eye-witness account for conveying the true horror of this dreadful tragedy. I can still remember where I was when I heard the first news of the Hillsborough disaster – listening to the car radio as I was driving back from a training day and the news made me weep. Thanks, Perpetua. I really don’t have much impact by publishing this, but I think that words are more efficient than pictures to make people think and realise that disasters like Hillsborough don’t just happen on tv – they can be experienced by any one of us, unfortunately, and can be forgotten way too quickly. The same date is now a sad one for Bostonians, too. I was concerned about writing it down as it could hurt people who were there. Writing it down was frighteningly spontaneous; it’s been etched in my head for the last 24 years. I had avoided putting those feelings on paper until now. What an incredible post… I remember watching news reports on the day but was too young to really know quite what was unfolding. This is probably the most personal and moving account I’ve ever read of it and it really brings home the horrific nature of what happened that day. Thank you for reading. As I said in my response to H&H just above, I hesitated about posting this. 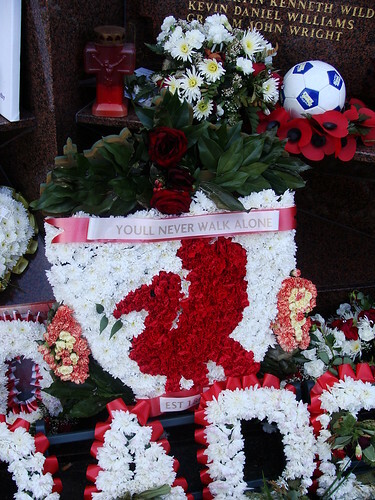 I have checked out the media and seen that nobody in the big newspaper brigade seemed unduly bothered about remembering the 96 and their families, although the media made a big deal out of the Independant Inquiry and its results back in September. The media will never change: zero humanity, zero respect of those they exploit to sell their papers. Thanks:-) I think this comment was intended for the post about cold calling. WordPress did something wierd last night and made the post disappear, and your comment has been attributed to the wrong post. grumble, grumble, incantation. This is so beautifully written. I am speechless, just speechless. Thank you for putting this out there. I can’t imagine how horrible it was having to witness a terrible, terrible tragedy like that. I felt like I was right there while reading it. I can’t help but wonder what happened to the man with urine stained trousers and tears in his eyes who fell on his knees before you. What a haunting scene you witnessed. I was not familiar with “football hooliganism”and had to look it up. I had never heard that term. You educated me although I know that was not your goal in writing this. I wish more people could read this. I dream about them because I will never know what wonder what happened to him, the little boy and the sobbing girl every time they appear in my dreams. When I lie there, I think that the experience that still awakens me at night no doubt does the same for them and their families too, but it must be so much harder. What was important for me when I wrote this was to make people aware of how frighteningly easily this kind of thing can happen, and hence (hopefully) make people realise that they are all potential actors in other people’s survival. Thanks for reading, and thanks for feeling. The anger, fear and grief your account expresses reminds me of the book I just read about the Tlatelolco massacre. I can’t imagine anything worse than being in the middle of something like that…helpless and terrified. I hope the memory of your experience softens with time. Hello, Tom! Thank you for your sympathy- it’s definitely not an experience one can ever forget but as you say, it can soften. I read your post (for other bloggers, I recommend having a read here: http://tomgething.wordpress.com/2013/05/01/tlatelolco-and-bolanos-debt-to-poniatowska/ ) and there’s no doubt that both the fictional and journalistic accounts of the Tlatelolco massacre must be extremely powerful reading. I don’t feel brave enough to take on that kind of pain in my reading yet – maybe one day I will. Read your powerful and very well written account. It was such a tragedy and as we have discovered compounded by further ignorance, greed and cover up. Very tough experience for you as a twenty year old. Thanks for reading, Tric. I will never forget that experience. A new inquiry has been organised – I hope that the families’ need for answers will finally be heard. Amazing and powerful post… What a horrific experience!! It was. Writing it down and publishing it was a form of therapy for me, but I think it’ll remain with me all my life.